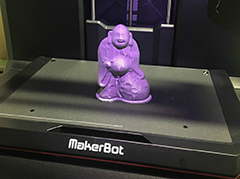 The Hermitage Museum and Gardens will present an exhibition, 3D Printing the Smithsonian, which features objects from the Smithsonian's Freer|Sackler Galleries. Ten artworks with ties to the Hermitage’s permanent collection will be displayed as 3D prints. The exhibition will educate visitors about the process of 3D printing, how it is utilized in art making and museums today, and will invite them to participate in the process of creation. Click here to view more info about this event.